Delivering a portfolio of products and consulting solutions singularly focused on securing our customers business critical data from cyber attacks. As organizations move to an agile DevOps model, they are confronted with one major question: How can they manage existing information-security processes to ensure data privacy? Since data breaches are not going to go away, organizations really need to focus on how to make breaches irrelevant so that in the event of a breach the data either will not be accessed, or if it is it won’t be in usable form. 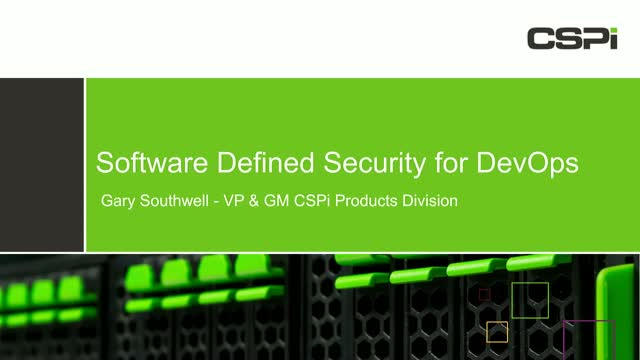 In this webinar, created for application developers and data security resources, CSPi will not only review best practices but also present a software framework to show how organizations can achieve uncompromised enterprise-wide security. Created for application developers and data-security resources, this webinar will also show you how this new approach complements established InfoSec security requirements and maintains the agile benefits of DevOps – all while providing the automated protection of critical data under any use. Don’t miss this webinar! Register today. 1.Uniformly and automatically apply security policies across the enterprise, including containers and VMs as they spawn. 2.Offload core-intensive security functions while improving application performance. 3.Secure critical assets in all cases – in motion, at rest, and in use. Take your Incident Response plan to a whole new level! In this webinar, join Cisco and CSPi as they discuss how automated breach notification takes Cisco’s incident response services to a whole new level. With FirePOWER and nVoy the incident response process can start immediately after a breach is verified and therefore be completed faster, in some cases the full impact of a breach can be determined in minutes. This can be extremely powerful for companies which rely on managed services providers for their cyber breach incident response strategy. With FirePOWER and nVoy Cisco’s IR professional services team will proactively monitor the solution for you and will receive email notifications when a potential incident is occurring against your organizations critical assets to trigger IR activity as per services contract. Up your incident response game! With increased volume and sophistication of intrusions and tightening data privacy compliance requirements such as GDPRs 72 hour notification, organizations must reduce their cyber–attack incident response times. - It will also trigger an extraction, from recorded data, of all the conversations involving those critical assets. Given the tightening notification requirements put forth by the General Data Protection Regulation (GDPR) - going into effect in 2018 - and other PII data privacy regulations, this immediately available data provides a complete evidentiary record of exactly what happened, to what records and when. Are You Prepared for Global Data Privacy and GDPR? Understanding and adhering to data privacy regulations has become much more complex. Security officers must be well versed in not only industry specific data privacy regulations, but also at the government level. Examples include the EU’s General Data Protection Regulation (GDPR) regulations impact on any business holding EU citizen data, the impact of US-EU’s privacy shield regulations, as well as the 47 separate states’ regulations dealing with personally identifiable information (PII). This leaves organizations struggling to understand how PII data – in the form of customer data and employee records - should be handled, and protected in a changing regulatory environment. Join this webinar to learn how emerging best practices and solutions are assisting organizations in securing their most critical data. CSPi's Myricom nVoy Series assists in targeted cyber forensic analysis, and compliance assurance for IT and security resources. With just a few minutes of effort, you can build a cost-effective cyber threat visualization solution and implement better network monitoring, data capture, forensic analysis, and regulatory compliance adherence functionality.